Lets start out with the factors that may seem out of our control. Number one being the exposure to toxins, heavy metals and other compounds that harm our bodies and keep them from functioning properly. Exposure to these toxins can come from the air we breathe, food we eat, water we drink, personal care products, beauty products and cleaning agents to name a few. Recently I covered the harmful ingredients found in many personal care products. Including know carcinogens, parabens and other compounds that are known to be skin, lung and eye irritants. This is due to corporate greed by using cheap, harmful chemicals for the sake of profit and weak industry regulations. By simply reading your labels to avoid synthetic artificial colors and dyes, parabens, unlabeled "Fragrances," phthalates and secret formulas, while only purchasing products from trusted, third party tested companies, you can cut out a big chunk of your daily toxin exposure. Pesticides and herbicides are another main contributor to our daily toxin exposures. From the cereal we eat, to the air we breath and the water we drink, traces of the herbicide "RoundUp" or it's active compound glyphosate are everywhere. A recent study commissioned by the Environmental Working Group, found that glyphosate, was in every sample of oat-based cereal and other oat-based food that was marketed to children. Three-fourths of those glyphosate containing samples had levels higher than what EWG scientists consider protective of children's health! Luckily, we can avoid these toxins in our foods by purchasing organic products. Organic foods are grown without the use of bioengineered or genetically modified seeds, synthetic chemical fertilizers, pesticides or herbicides. The soil for organically grown crops is fertilized by natural means, such as compost or manure. Farmers control weeds naturally with crop rotation, hand weeding, mulching and tilling. Bothersome pests are managed naturally by using birds, other insects, hand picking, traps and naturally-derived pesticides. While those are some exposures that can be avoided there are still some that are beyond our control. Depending on where you live and how industrialized the area is your exposure to toxins in the air can be a significant factor. Ideally, we would shut down these places pumping out toxins into the air, but sadly this isn't an option for most. When the exposure go beyond your control the next step is to regularly eliminate them from your body. Build up of heavy metals and environmental toxins such as lead, mercury, radon, formaldehyde, benzene, cadmium, BPA, phthalates and pesticides in the body can lead to improper organ function or damage, act as endocrine disruptors and even cause cancer. There are many natural ways to eliminate toxins from the body from simple diet modifications to extensive detox diets. The easiest of the detox methods is simply to drink more water. Drinking at least 8-10 cups a day can be a great way to flush your system of toxins. Exercise is another common method because sweating is a great way to eliminate toxins. Trying a sauna or steam bath on days when you cannot workout is also a great option. One of the most important organs or glands for weight management that can get damaged or disrupted from these toxic exposures is the thyroid gland. The thyroid gland covers the windpipe from three sides. Two hormones of the thyroid gland, T4 (thyroxine) and T3 (triiodothyronine), help the body to produce and regulate the hormones adrenaline (also called epinephrine) and dopamine. Hormones are chemical substances that help control certain cells and organs. Adrenaline and dopamine are active in many physical and emotional responses, including fear, excitement, and pleasure. Other hormones from this gland also help regulate metabolism, which is the process by which calories and oxygen are converted into energy. Without a functioning thyroid, the body would not be able to break down proteins and it would not be able to process carbohydrates and vitamins. For this reason, problems with this gland can lead to uncontrollable weight gain. For many people, these irregularities can be controlled through supplementation, as well as a modification of their diet. This is probably the number one factor with most people that can't seem to lose weight no matter what they do! Without a properly functioning thyroid all your hard work in the gym and meal planning can seem to go nowhere fast. In fact, according to the National Women’s Health Information Center, there are roughly 20 million Americans suffering from some type of thyroid disorder. Even more surprising, it’s estimated that 60% of those in the world suffering with thyroid issues are completely unaware this is the root of their problems, including weight gain or fatigue. Thyroid disorders can seem to effect just about every are of our daily lives. From weight issues to depression and/or anxiety, the thyroid gland is vital to keeping your physical, mental and emotional life in balance. Of the thyroid disorders, hypothyroidism is by far the more common type of thyroid problem. Most people with hypothyroidism are women, especially those who are of reproductive age or middle-aged. 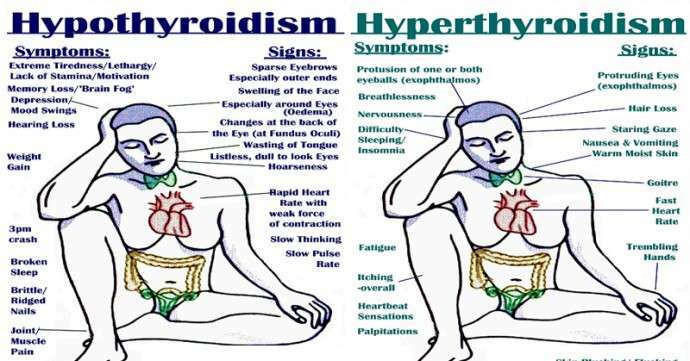 Hypothyroidism literally makes your body slow down. This is why symptoms like weight gain, brain fog and sluggishness are common. Hyperthyroidism causes the opposite effect. It creates a sped-up metabolism, to the point that your heart may beat faster and you may have a hard time eating properly or keeping enough weight on. Because your thyroid controls appetite, body heat and some aspects of energy expenditure, changes in thyroid hormones can cause your metabolism to either slow down or to speed up. Neither of which is comfortable or healthy, and can both be dealt with in natural ways. Many of the patients with hypothyroid diseases are deficient in iodine, so increasing your iodine intake can likely help your thyroid produce more of its needed hormones. 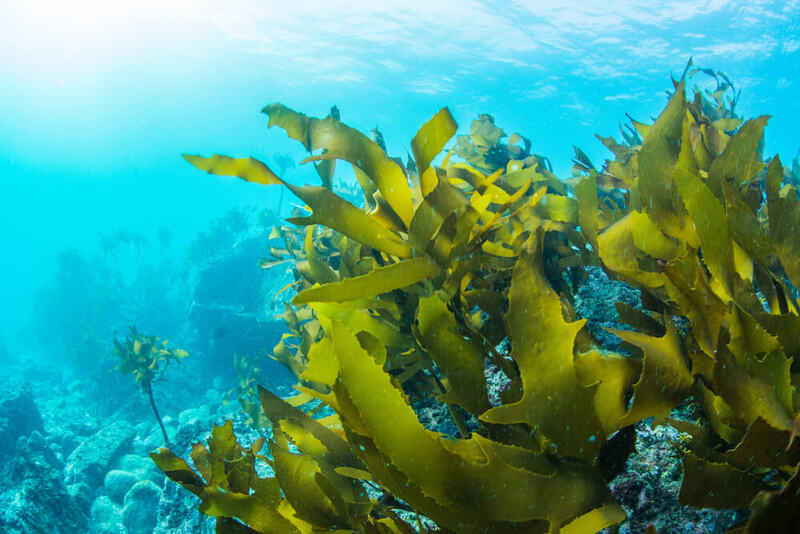 Iodine is a key mineral in converting and releasing thyroid hormones, but iodine-rich foods like seaweed or kelp and even algae like chlorella or spirulina are limited in the typical Western diet. This is just one of the reasons why we have created our amazing greens supplement, which includes chlorella and spirulina. It is designed to help fill common nutritional gaps in most diets as well as detox, rejuvenate and energize your body. This supplement truly makes eating your greens easy and tasty! So, if you are someone struggling with weight management or just getting your body to your desired fitness level. Try limiting your exposures to toxins in foods and personal care products. Detox your body by drinking more water, exercising and sweating through sauna use, and make sure your getting enough detoxifying nutrients in your diet through organic foods or supplements like our superfood greens. This will be the natural path to fast track your fitness goals!